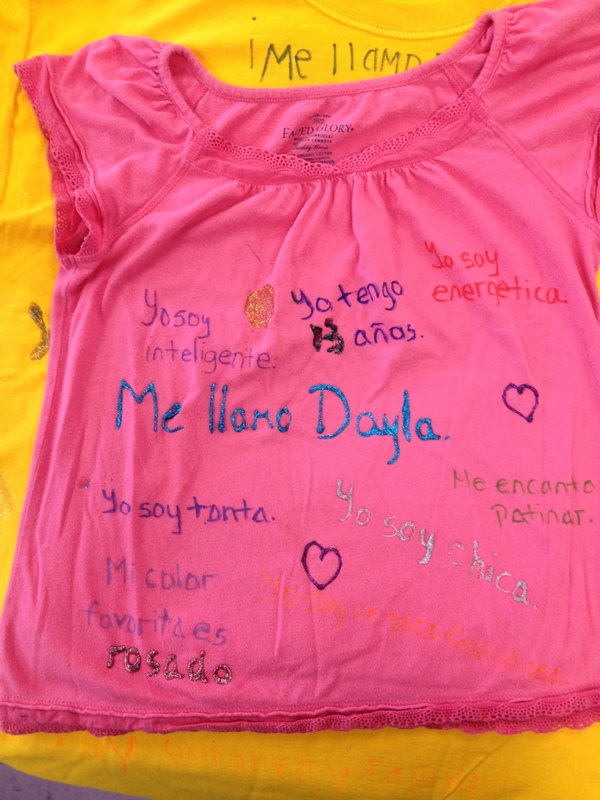 One of my absolute, all-time favorite activities to do this time of year is the ‘me-shirt.’ My students love any excuse to not wear their uniforms and this projects gives them a creative, fun, (and most importantly) communicative way to share their style. Objective: Students will be able to describe themselves in the target language and compare what others wrote about themselves. Materials: Ss will need a blank, light colored t-shirt, their notebook, and a pencil/pen. A week before the activity, I ask students to look for a blank, light colored t-shirt that they have permission to write/draw on. They don’t know why. For homework the day before the activity, I ask students to write at leas t 10 sentences to describe themselves in Spanish. I expect at least half of the sentences to be at least 5 words long and at least one of those to be a compound sentence (the requirements will depend on your students’ level). In class on the day of the activity, I have students peer-check each other’s sentences (to make sure no one ends up embarrassed by their shirt) and I walk around to double-check my more struggling students and/or answer questions. When everyone is confident in their sentences, I explain the activity: we will have the rest of class (about 45 minutes) for this activity. 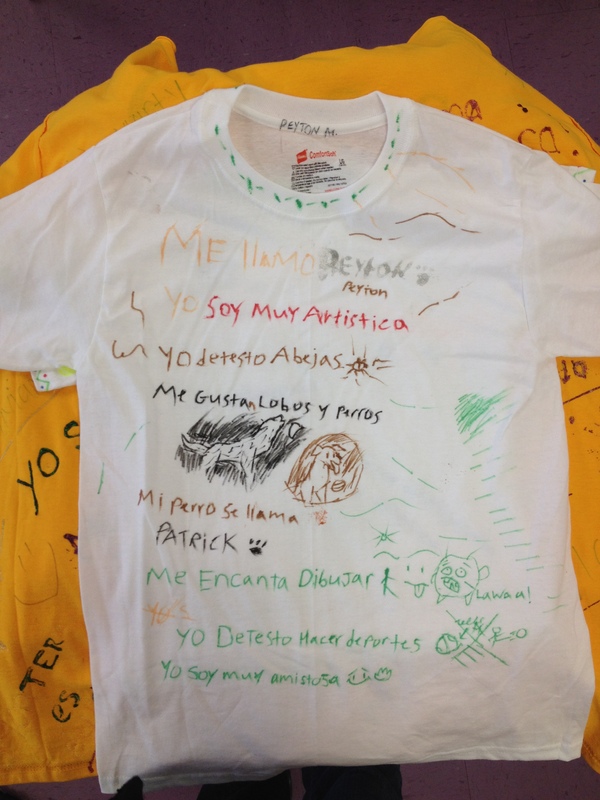 Every student will make a custom t-shirt (me-shirt) that describes themselves in Spanish. They can draw anything they like (as long as it’s appropriate for school) and can write as much as they want as long as it’s in Spanish and includes at least the 10 sentences they wrote for homework. I bring out the supplies and explain any necessary procedures about how we will be using them. 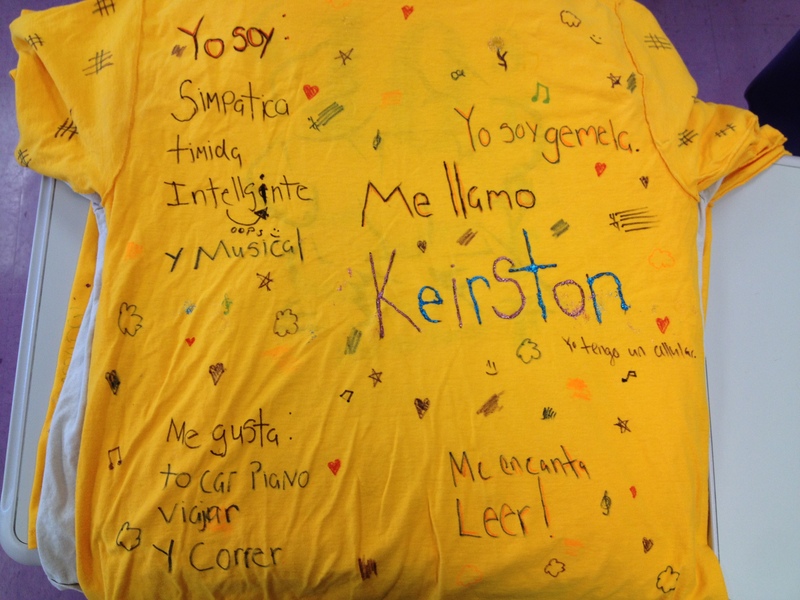 Students spend 45 minutes having fun, being creative, comparing their shirts, and practicing their Spanish. I walk around to help – especially if students want to test out a more advanced construction. The shirts have to dry in my classroom overnight, during which time I write up a quick ‘quiz’ about the students in each class (who has red hair, who likes animals, etc). The following day students pick up their shirts and wear them over their uniform. Then in class I take about 15 minutes for them to present their shirt to the class and ask each other questions. Then, we play a quiz game to see who remembered the most about their classmates. They get to be creative, break dress-code, and compete with each other. This has always been a winner in my classroom! Bonus: if there’s a spirit week or something similar at the end of the year, ask your principal for permission for a second showing of the shirts. Really, any excuse not to wear uniforms is met with excitement. If you’re looping with your students the following year, have them wear their shirts during spirit week in the fall to get your new level 1’s excited.